Looking for work isn't always easy. 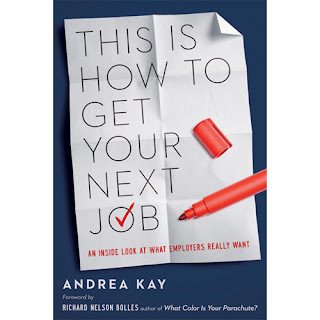 Andrea Kay contends it has nothing to do with tough job markets, your skills, or experience. According to Kay, it's how potential employers see you. 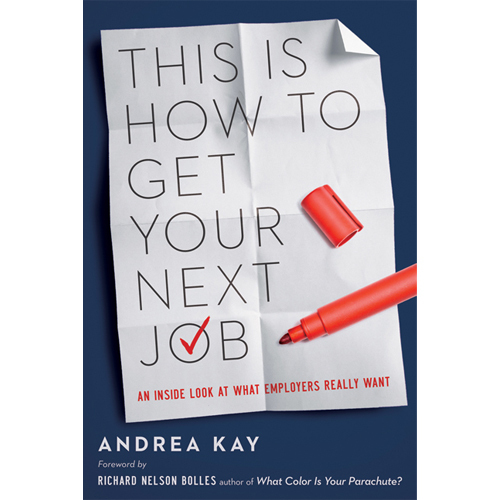 In This Is How To Get Your Next Job, leading career expert Andrea Kay uses her years of experience combined with candid insights from real-life employers to provide readers with tips on how to influence the people in charge of hiring. A combination of exercises and information, This Is How To Get Your Next Job will make you more confident as you seek your next opportunity. This makes the book sound simplistic, but it's not. Kay provides a wealth of information for job seekers. She goes into great detail for each and every tip she shares. Her conversational style indicates a passion to help, and her years of experience shine through from the first page to the last. I've been looking for a job the past few months. I can honestly say that I felt more confident going into my latest interview after reading this book than I did in the past. Following Kay's advice, I performed the exercises in the book to focus on who I am, what value I have to offer, and how I want to seem to potential employers. After leaving this week's interview, I knew I did better than before. I have a follow up interview scheduled for next week. If you're job hunting, This Is How To Get Your Next Job can provide the tools you need to help mold your interview style so you more successfully relay to potential employers what you want them to know about you and how you can be of value to them.